Starting 21 January 2013, there has been a concerted and coordinated disinformation campaign by the media about the situation in Eritrea and the so-called “attempted military coup d’etat“. There has never been an “attempted military coup” and there will never be a coup d’tate in Eritrea. It is the wishful thinking of some quarters. I say this with impunity. You might say why not? It is a legitimate question. 1. The social fabric and the military structure of Eritrea do not allow for such disastrous and stupid action to take place. It is a society built on trust and an unflinching commitment to the unity of the people and the economic development of the country which emanates from the vision which is casted in the heart and mind of every Eritrean that our Martyrs, whose pictures are hanging on the walls of every house, have entrusted on us. As a national service participant as well as a member of the reserve and regular army, almost every able-bodied person in Eritrea is armed. As a result who is going to fight whom? And who is going to mobilize whom? Therefore, unless somebody is stupid or crazy he/she will not attempt a military coup that is destined to fail from its inception. With the exception of the Air Port, no Government Office or Institution, be it the President’s or Ministers’ Offices, Hotels, or Banks etc…use metal detectors or electronic screening machines. Ministers or Military Commanders, including the President’s wife and children are simple citizens and live simple lives. You find them and see them in any public places without bodyguards. As is the case all over the world an armed crazy, stupid and terrorist individual or group can take stupid actions such as kidnapping of individuals or taking hostages by raiding government and private institutions and offices. Such isolated incidents which frequently occur in the West are considered terrorist acts. I don’t understand why in Africa they are considered coup d’états. It is the highest form of double standard and hypocrisy. The spin-doctors who have deliberately targeted the Eritrean People and Government, nine months ago said that the President is dead. Today they are saying there is an “attempted military coup”. I am sure that tomorrow they will come up with another fabricated news. Rest assured that the President is healthy; and Eritrea is a peaceful country and its people and army are fully concentrating on their economic development agenda and protection of their sovereignty. Even kids are teasing with their President's way of life and easines. Politics aside, its a fact. Mr. Ambassador thank you for your insight. As an Eritrean I have deep trust and appreciation for my leaders and the Eritrean people for their steadfastness and resiliency. Eventually with the commitment and deep love of our country our victory is inevitable. Deki Ere, let's forget the distraction, and get back to business of developing our beloved country. The problem for the 'ant camp' is their utter inability to fathom the degree of Eritrean Nationalism. Even after all this time, they seem unable to come to terms with the notion, that for Eritreans the love and passion they hold for their country supersedes anything and everything. There is no amount of carrot or stick that will alter the red blood of fire that pumps through every Eritrean Man and Woman vein. I'm proud of my people, and my leaders. I trust their wise decision to take thier time and see everything with cautions. This is what a leader makes him a leader. Before, you run and fall in a trap, you see what is coming and make decisions accordingly. I saw many people who call themselves "opposition" discussing about our country and if they heard that no electricity in town,then they will make sure the other generator is broken and the whole country is out of electricity. If they heard that no bread in town, they make sure or wish never bread provided to the people. If there is an incident, they make sure or pray that the incident changed to war. What a non-sense wishy-wishy. This is really not coming from positive thinking. God Bless my country, my people and my leaders. Peace to Marytrs. "I think we've over interpreted what happened on Monday. I don't think it was ever a coup…..I don't think they were trying to seize power. I don't think they made any demands in that direction." Time for the rest two lead yellow journalists and hasadat to come to their sences: Martin Plaut and Léonard Vincent. 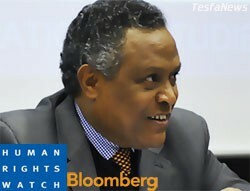 The bombardment they have been receiving from "Eritreans" from all wlks of life is beyond what they can comprhend. They probably cursed the day they concocted that Hoax 'coup' news.